We have received several e-mail messages from customers telling us that one of our competitors distributes to potential clients a table comparing their software with ours. The comparison entails negative value judgments about ATLAS.ti, based on absurd indicators. Most of the statements concerning our software are false and/or misleading, statements about our company ranging from laughable to libelous. Also, some seemingly "independent" comparison tables of ATLAS.ti with other products that you may find on the internet exhibit a serious lack of knowledge of ATLAS.ti, at best, or clearly malicious intent at worst. Such comparisons should always be approached with the greatest caution. While the experienced QDA software user will eventually see through the smoke and mirrors, the novice is in jeopardy of falling prey to such questionable practices. Rather than relying on misinformation for advertising ourselves, ATLAS.ti always invites prospective customers to install the free trial version and compare it directly to similar products with real-world material and as thoroughly as possible (one of the reasons why our trial version has no expiration date!). We even offer full support for the trial version, just so can experience the complete package in every single one of it facets. You may also attend one of our free webinars, or request one exclusively for your group, in which we will demonstrate the software and answer your questions. Further, we make available a telephone number where you can call us and talk directly to us. The reason behind all this is simple: We want customers to be absolutely sure that they are selecting the absolute best tool for their jobs. Choosing the software that is exactly right for you and your concrete work is a process that cannot and should not be replaced by a simple glance at a feature table--especially when such material is created in a misleading fashion. If you or your colleagues ever receive information from one of our competitors concerning our company and/or our software, or find comparison tables of ATLAS.ti with other products, please contact us and let us know. We will answer your questions and clarify any concerns you may have. ATLAS.ti does not engage in false advertising, nor do we condone damaging representations of our product. We will never speak negatively about our competitors because we respect their contribution to the QDA software field. Computer assisted-qualitative data analysis has developed through the years tremendously, and this development has been fed by healthy competition, which we value highly. After more than twenty years in the QDA market, ATLAS.ti continues to push the envelope of technological innovation more than ever, through the release of new products and the constant improvement of current ones. The release in 2013 of ATLAS.ti Mobile (iPad and Android), was followed by a real native ATLAS.ti Mac in 2014, and this year will still see the release of ATLAS.ti 8 for Windows. Each one of these releases pushes forward the boundaries of what is possible, always looking for the best ways of meeting users' needs. Now, enjoy the October issue of INSIDE ATLAS.ti. In this issue, we keep you updated on what is going on with ATLAS.ti as well as share our training calendar for the next two months. Additionally, we invite you to read an article discussing the use of ATLAS.ti in literature reviews and another one on the use of the software in a study examining the Occupy Wall Street Movement. We hope you find these articles, and the October issue of INSIDE ATLAS.ti in general, informative and useful. The second ATLAS.ti user conference took place in Berlin, Germany, from August 29- 31, 2015 . ATLAS.ti users from around the world came together to participate in cross-border discussions, join interesting symposia, and learn from certified ATLAS.ti trainers. The ATLAS.ti team prepared a diverse program that even included a beautiful river cruise through Berlin to offer a special view of the city. Networking breaks in-between the presentations gave room for conversations among new and old acquaintances. We would like to thank all participants, speakers, moderators, and most of all, the many ATLAS.ti users from over twenty countries for making the conference such a successful event! Please visit the conference web site for full presentation slides and photos of the event. Our Facebook profile has additional photos. Since it was released in September 2014, ATLAS.ti Mac has been expanding its functionality, integrating tools and procedures that researchers deem necessary for optimal data analysis. Although new tools and procedures are being regularly released in order to best meet users’ needs, ATLAS.ti Mac has now reached a point of maturity as a powerful qualitative data analysis software. Developed from the ground up as a Mac native application, but following the footsteps and rich tradition established by ATLAS.ti Windows in more than 20 years of existence, ATLAS.ti Mac represents the synthesis of simplicity, functionality and power. With update 1.0.30 (released on August 21, 2015), ATLAS.ti Mac has incorporated powerful query, filtering and output tools ( read here the Update summary sheet ). 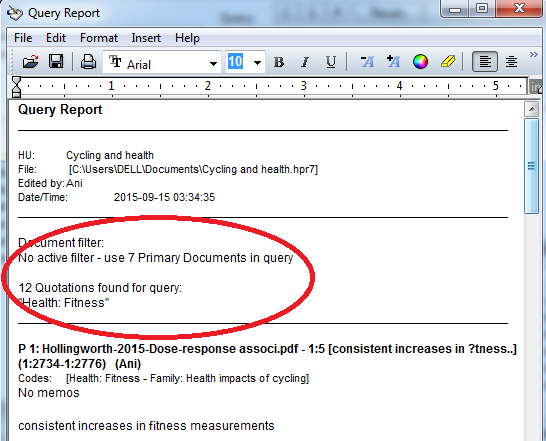 Now, it is possible to filter and query your quotations, documents, codes, memos, links, groups and smart groups. The query tool, which is found on each of the object managers, allows to interrogate the ATLAS.ti project using a large number of 'rules', including the Boolean, Semantic and Proximity operators already available in the Windows version of the program. But, importantly, the Mac version of ATLAS.ti incorporates many more query rules beyond the classical operators, allowing for truly powerful ways of interrogating the data. Further, the simple interface makes the function easy to use. All outputs can be produced in table format through Excel. Previously, we had released Update 1.0.25 (build 102), which brought the Code-Document Table, video snapshot documents, and improvements to the network editor and the co-occurrence table ( read here the Update summary sheet). Check our video library for our new tutorials. New overview video tutorials have been created for ATLAS.ti 7 Windows and ATLAS.ti Mac. Additionally, you will now find videos showing the new features of ATLAS.ti Mac. For instance, take a look at the ones showing the query tool and outputs in Excel. If you would like us to create videos for specific functions not yet available in the library, let us know. We will be happy to do so! ATLAS.ti supported this year’s Summer Program of the Inter-university Consortium for Political and Social Research (ICPSR). The event took place at the University of Michigan in Ann Arbor. To learn about ICPSR, please visit the Consortium’s website. [IMAGE gabriela]The winner of the ATLAS.ti license that we raffled at this event was Gabriela León-Pérez, doctoral sociology student at Vanderbilt University. She will be using ATLAS.ti in her dissertation research. Qualitative Health Research Conference on October 19, 2015. ATLAS.ti is the Platinum Sponsor of the 21st Qualitative Health Research Conference, taking place in Toronto, Canada, between October 19th and 21st. The conference is organized by the International Institute for Qualitative Methodology (IIQM). This year's conference theme is “Qualitative Health Research: Informing Practice, Policy and the Preferred Future of Healthcare”. In addition to the conference, ATLAS.ti sponsors all IIQM academic events this year. We are particularly proud of the monthly webinar series on qualitative methodology and of the ATLAS.ti-IIQM Dissertation Award, through which we support graduates of Master’s and Doctoral programs. If your organization is evaluating ATLAS.ti or you want to introduce it to your students or at a professional meeting, schedule a presentation with one of our instructors. We would be happy to tailor the presentation to your needs. To schedule a presentation, please complete this registration form. We would like to invite you to join us on a lecture by Melanie Birks & Jane Mills, from the James Cook University, on Friday, October 23rd at 12:00am CEST. They will present "Philosophical positioning in grounded theory: Striking the balance". Register here. Furthermore, we would like to invite you to join on a lecture by Joh Oliffe on Thursday, November 5th at 10:00pm CET. John Oliffe will present "Doing gender and health research". Register here. These presentations are part of the webinar series of qualitative methodology ATLAS.ti co-sponsors with the International Institute on Qualitative Methodology (IIQM). About once a week, we present introductory webinars in the English and Spanish languages. These webinars are offered at different time zones, thus meeting needs of users worldwide. The English language webinars are offered at EST (New York) and SGT (Singapore) time zones. The Spanish language webinars are offered at CEST (Madrid) and ART (Buenos Aires) time zones. Once you click on the registration link, you will be given the option of showing the webinar time using your own time zone. Purchase and register for courses here. 21st Qualitative Health Research Conference in Toronto, Canada, October 16th till 21st 2015, visit the Institute website here. American Public Health Association 2015 Annual Meeting and Exposition in Chicago, USA, October 31st till 4th November 2015, visit the organization website. The literature reviews process is probably one of the most crucial aspects in a research journey; it is the process which allows the researcher to build knowledge on the subject matter, develop conceptual and theoretical frameworks in the research, pin point the methodological focus in aid of identifying the gap in the research area. Bearing in mind that the literature reviews process is not only undertaken by qualitative researchers, but also by quantitative and mixed-methods researchers, this short article is prepared as general as possible to explain some common problems in doing literature reviews, and how these problems are addressed by using simple strategies available in ATLAS.ti 7. There are at least three common problems faced by a researcher in conducting literature reviews, the first one is the improper management of literatures . Some researchers end up in stacks of hardcopy books, reports and articles, mixed with softcopy of literatures in the laptop, the cloud, the flash drive, the external disc and etc. Not only that the literatures are available in different formats at different locations, they are also not organized according to specific attributes, for instance year of publication, journal type, publication type and etc. The next problem is the unsystematic management of important points contained in these literatures. Certain points appear in multiple literatures but not often that the researchers have a system to gather or manage these important points to be in one place. Some researchers have the initiative to use the traditional highlighters, or write sticky notes, or prepare a matrix table of the points, or back-to-Excel format to manage these points. Another problem faced by researchers is the ‘writer’s block syndrome’ in which the researchers know exactly the points to be discussed, but at certain points, they could not actually write them down (Rose & Rose, 2009; Boice & Jones, 1984). Very often this syndrome serves as a drawback to the researchers during the literature reviews process. Given that literatures are commonly in the format of textual (such as PDF, RTF, DOC) or graphical (such as protected PDF, JPG, PNG), this article elaborates on the adoption of ATLAS.ti 7 as a powerful tool to improve literature reviews process based on the author’s own experience as well as the experience of few other users. These strategies are divided into three main phases, which in turn coincides with the three common problems discussed earlier. The phases are: (1) management of literatures, (2) management of important points in the literatures, and (3) overcoming the writer’s block problem. Before starting a new project in ATLAS.ti, I need to make sure my literatures are in the correct format, essentially, they need to be in softcopy format for the obvious reason that I am approaching them using software. They can be in textual format, such as PDF, RTF, TXT or DOC, which could be easily downloaded online. Alternatively, they can also be in graphical format, such as protected PDF, JPG or PNG images resulting from scanned versions of hardcopy literatures or any literatures found offline and then converted into softcopy format. How I approach this step as part of my management of literatures is to save all documents in a single folder on the computer’s desktop for easy access. This way, I will not have my documents scattered in different formats and located at different locations, and I can always reach out to them if needed at any time. 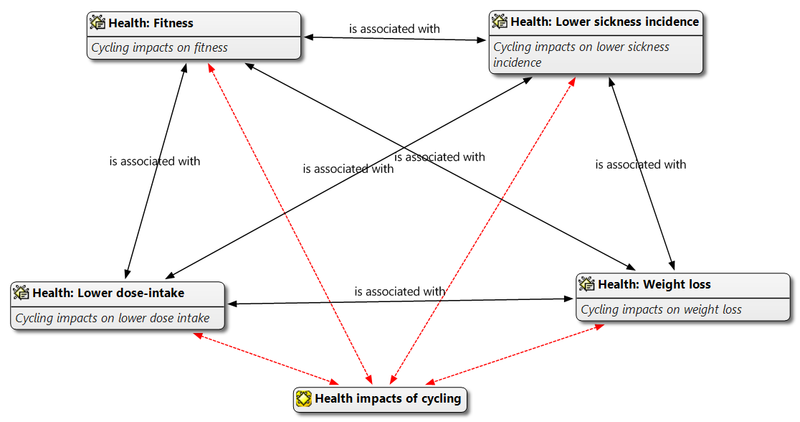 For the purpose of this article, I am using 7 documents revolving around the issues of ‘cycling’ and ‘health’. Next, I also rename all my documents to be in a consistent format, such as [Author, Year, Title]. The rationale for doing this is that I can immediately identify the document’s citation and the main discussion in the reference without actually having to open them individually. Another rationale is the format of the output in ATLAS.ti, which retrieves the important highlighted points (referred to ‘quotations’ in ATLAS.ti) to be attributed to the document’s name. This will be explained in more detail in the following parts. The next step is to add the PDF documents into the ATLAS.ti project (referred to as ‘hermeneutic unit’ or ‘HU’). I choose to add the documents into the Library of the HU. Because all the 7 documents are now located in the Library, I can easily access the documents (referred to as ‘Primary Documents’ or ‘P-Docs’ in ATLAS.ti) with simple clicks in ATLAS.ti to view one document to another, by using the Primary Document Manager function in the HU. At this point, I added to the ‘comments’ section of each of the P-Docs the citation and a short abstract of the documents for easier reference later as shown in Figure 1 below. After all the PDF documents are added to the My Library, I then proceed to group the documents based on shared characteristics or attributes, using the ‘Primary Documents Family Manager’ feature in ATLAS.ti. The grouping of the documents into specific families is decided against the shared characteristics or attributes of the references, such as year of publication, place of publication, methodology undertaken in the research, and etc. The significance of creating such families is that I am able to comparatively view or analyse the pattern of discussion in the literatures according to the respective shared characteristics (Mohamad, 2014). For instance, what is the pattern of discussion of Journal X as opposed to Journal Y? At this point, I have 4 families altogether divided into publication year and methodology undertaken in the research as shown in Figure 2 below. I have now completed the first phase of the process being the management of the literatures. Now not only I have one central location to put all my literatures (the Primary Documents Manager), I also have the literatures grouped into specific attributes or characteristics (the Primary Document Family Manager) for proper management of the literatures in ATLAS.ti. In the second phase, I wish to explain about the different features in ATLAS.ti which can facilitate the management of important points in the literatures. The features are codes, quotes and memos. These features can further be explored by using other features such as the query tool and the object explorer, which will be explained in more detail in the following parts. First, I make use of the coding system in ATLAS.ti using the ‘Codes Manager’ function. Codes are themes or constructs that are relevant in the research project (Smit, 2002; Muhr, 1991). In building a decent code list for my literature review project, I need to recall the research questions and objectives for my research in the bigger context. For the purpose of this article, the research question is: How do sports impact upon health ? Accordingly, the research objective of the project is to examine the impacts of sports upon health . It is highly important to be clear of the research objectives and questions throughout the research project, including at the literature review process. By having clear questions and objectives, I am then able to build a code list for my literature review exercise. When I already have certain concepts forming my framework, I would then add these concepts to the project by creating new codes. For instance, for this current literature review project, I would recall my research question and objective, and come up with a few concepts for deductive coding process (Fereday & Muir-Cochrane, 2006). I add these concepts as codes in the ATLAS.ti project, and appearing as a list in the Codes Manager. Once added as codes to the project, I then can approach my literatures deductively and link the important segments in the literatures to specific codes which are relevant to them. As I start to code my literatures deductively, I also come across new themes and ideas, hence I also start to code inductively (Fereday & Muir-Cochrane, 2006). Finally, I have 7 codes altogether in my Codes Manager, comprising of both deductive and inductive codes, as shown in Figure 3 below. From time to time, I also make use of the auto-coding function in ATLAS.ti for a number of reasons. First, I wish to look for the frequency of specific keywords I need, particularly to assess the relevance of the P-Documents to my area of research. Second, I also wish to pinpoint the location of the specific keywords in my literatures, and how the keywords are used in context. In order to give me the general basic idea of which keywords to use, I also use the Word-cruncher feature in ATLAS.ti for this purpose. From the Word-cruncher results, I am able to screen through the potential keywords I could use for my auto-coding exercise. After a while, I would find myself ending up with a lot of codes in the Codes Manager. I would then revisit the list of codes in search of redundant and overlapping codes. In such a case, I would look at the affected codes, and decide if it is proper to merge the codes into a single code. If it is not proper to merge the codes because they are not entirely similar, but they do have some similarities, I would group them into Code Families. After completing the coding exercise and understanding the literal aspects of the text segments, I now move on to the use the Memos function in ATLAS.ti with the aim to analyse the text segments interpretatively. I have the option of creating free memos, or linked memos. Free memos are important notes or reflections relating to the research project, for instance the ‘To-do List’, the ‘To double check’, and other. On the other hand, linked memos are my interpretative analysis of the text segments, or referred to as ‘quotations’ in ATLAS.ti. I can further convert any of the memos into P-Documents if the need arises. 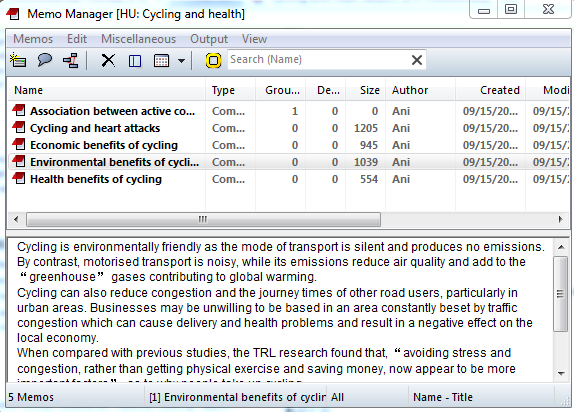 My list of memos contained in the Memos Manager, comprising of both free and linked ones, are shown in Figure 4 below. From time to time, I also explore the quotations by using the query tool function and limiting to certain scopes of the documents depending on my query, as shown in Figure 5 below. At this point, I also often use the HU Explorer to keep track of the development of my literature reviews exercise focusing on the various objects available in the HU, as shown in Figure 6 below. 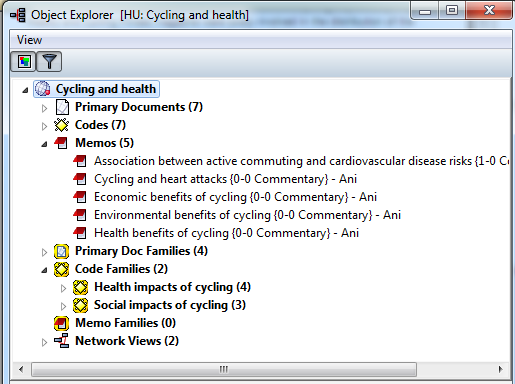 To address the third common problem in undertaking the literature reviews exercise – the writer’s block problem – ATLAS.ti provides three convenient formats for the output of the important segments of the text in the literature review HU, being (i) visual, (ii) textual and (iii) numerical. Guided by these three output formats, all the quotations are now produced in a single location for my reference for the purpose of the reporting or reviewing the literatures. In essence, these three outputs work wonders in overcoming the writer’s block problem as now the entire important text segments which have been highlighted earlier are gathered or placed in single location, hence facilitates my literature review exercise. For the visual output, the feature I use in ATLAS.ti is the network views. It is a convenient way of viewing different objects in my HU visually in two types of links – weak and strong links. Weak links are relations I create between different objects (such as codes-quotations, documents-codes, and others) that are created in daily work with the program. On the other hand, strong links are relations that carry semantic or meaningful links between two similar types of objects, i.e. codes-codes and quotations-quotations. Examples of the semantic or meaningful relations are ‘is cause of’, ‘indicates’, ‘discusses’, and ‘is property of’. Both weak and strong links can be seen in Items 1 and 2 respectively of Figure 7 below. I can then export the network views into PNG format to be used in my Word editor or Power Point presentations. 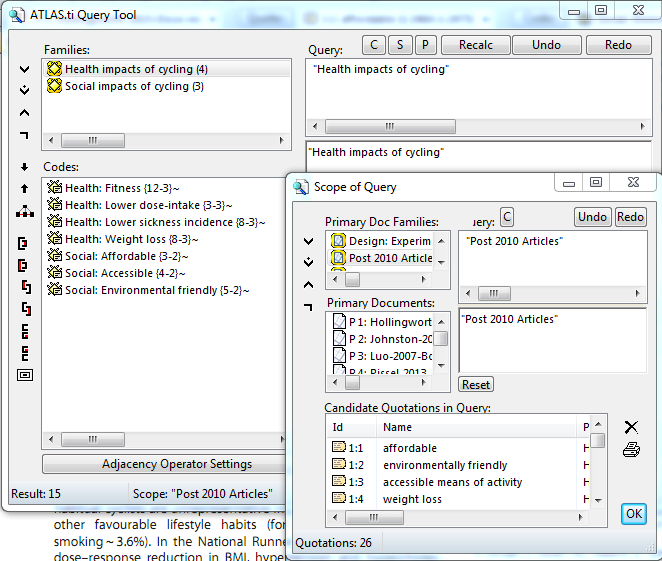 As for the textual output, I can maximize the use of the query tool to produce a textual output in the format of RTF, for specific codes or code families that I need (as shown in Figure 8 below), or by setting the scope of the output in respect of specific P-documents or P-Document families (as shown in Figure 9 below). The third format for the output in ATLAS.ti is numerical. This type of output is significant when I am exploring further the words or quotations for each of the codes as against each of the P-documents. This output is produced in XLS format, being a table in Excel showing the number of words or quotations of each code as against each P-Documents. This table is known as ‘Codes-P-Documents table’. A sample table is shown in Figure 10 below. In this article, I have shared the strategies I use to improve my academic literature review. I believe that using excellent qualitative software such as ATLAS.ti is indeed beneficial and suitable for the purpose of writing good literature reviews. Nevertheless, I need to emphasize at this point that there is no software in the world that can replace the reading process, and that there is no ‘push-button’ in ATLAS.ti itself that can magically write a review of our literatures. However, as can be seen from this article, ATLAS.ti is a powerful tool that can address the major problems faced in doing literature reviews. The software helps to manage the literatures, manage the important points in the literatures, as well as address the writers’ block problem. 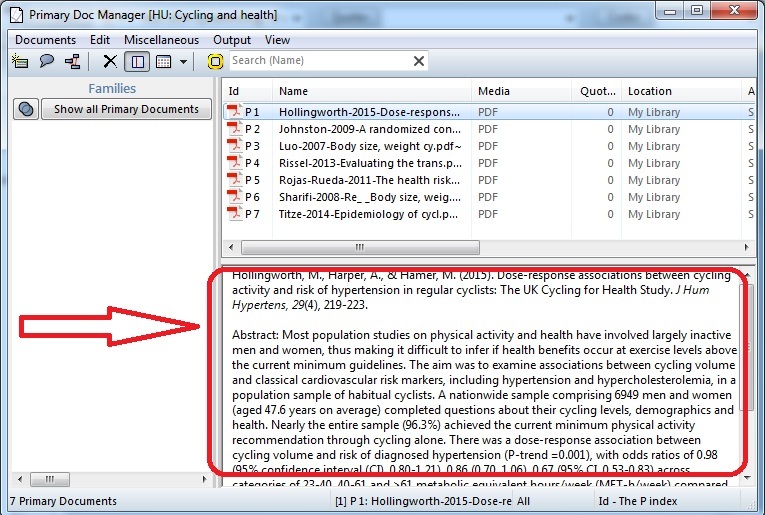 In essence, it is a great tool for improving the literature review exercise. Boice, R., & Jones, F. (1984). Why Academicians Don't Write. The Journal of Higher Education , 567-582. Fereday, J., & Muir-Cochrane, E. (2006). Demonstrating Rigor Using Thematic Analysis: A Hybrid Approach of Inductive and Deductive Coding and Theme Development. International journal of qualitative methods , 5 (1). Friese, S. (2014). Qualitative Data Analysis with ATLAS. Ti (2 nd edn.) . London: Sage Publications. Konopásek, Z. (2007). Making Thinking Visible with Atlas. ti: Computer Assisted Qualitative Analysis as Textual Practices. Historical Social Research , (32). Mohamad, Ani Munirah (2014). Using ATLAS.ti 7 for Researching into the Socio-Legal Implications of ICT Adoption in the Malaysian Courts, in Friese, Susanne and Ringmayr, Thomas (eds. ), ATLAS.ti User Conference 2013: Fostering Dialog on Qualitative Methods. University Press, Technical University Berlin. Muhr, T. (1991). ATLAS.ti — A Prototype for the Support of Text Interpretation. Qualitative Sociology , 14 (4), 349-371. Reuters, T. (2011). EndNote®. Bibliographies Made Easy™ http://www. endnote. com . Rose, M., & Rose, M. A. (2009). Writer's Block: The Cognitive Dimension . SIU Press. Smit, B. (2002). ATLAS.ti for Qualitative Data Analysis: Research Paper. Perspectives in Education , 20 (3), p-65. For this issue of INSIDE ATLAS.ti, we interviewed Dr. Heather McKee Hurwitz, recent graduate of the doctoral program in Sociology at the University of California, Santa Barbara. Currently, Dr. Hurwitz is a post-doctoral fellow in the Athena Center for Leadership Studies and in the Sociology Department at Barnard College. For her dissertation research, Dr. Hurwitz studied the Occupy Wall Street Movement. In this interview, she discusses her project and the way ATLAS.ti was used in the analysis of the research data. (To contact Dr. Hurwitz, send her an email to [email protected] ). Tell me something about yourself. What is your academic background and the nature of your research? Thank you for the opportunity to discuss my research and how I use ATLAS.ti. Currently, I am a Post-Doctoral Fellow in the Athena Center for Leadership Studies and in the Department of Sociology at Barnard College in New York City. In June 2015, I completed the Ph.D. in Sociology from the University of California Santa Barbara. I study the persistence and transformation of social movements using feminist and intersectional analyses and qualitative and quantitative methods. My goals are to research and change how gender processes and social inequalities matter to the development of contemporary mixed-gender social movements, tactics, strategies, and culture. Currently, I am revising my dissertation for publication as a book to be entitled, The 51%: Gender Conflict and Feminist Mobilization in the Occupy Wall Street Movement. Also, I am writing an article on the organizational and structural dynamics of Occupy’s gender regime. What was the dissertation project about? Social movements researchers have explained that gender inequality and hierarchies shape social movements. Also, feminist movements are taking new forms within a variety of institutions and contexts. Contemporary social movements are shaped by second wave feminism, contemporary feminism, and anti-feminist backlash. In addition, scholars of gender and organizations have identified changes in cultural beliefs toward gender equality and the greater inclusion of women in the workplace, but also the persistence of traditional gender stereotypes and the continued reliance on men’s leadership in contemporary workplace contexts and the family. Yet, we know little about how these patterns of gender inequality, gender egalitarianism, and new forms of feminism shape contemporary mixed-gender social movements. My dissertation is one of the first studies of the Occupy Wall Street Movement (Occupy) to focus on gender, feminism, and social inequalities within the movement. Widely mobilized in 2011-2012, Occupy was an ideal case to examine the dynamics of contemporary mixed-gender social movements. I bring an intersectional and feminist analysis to understanding the movement. I collected data in the two movement centers: New York City and Oakland/San Francisco. I also collected data at the first Occupy National Gathering in Philadelphia. The qualitative and quantitative data include participant observation, in-depth interviews, the Occupy Research Demographic and Political Participation Survey (n=~5000), and archival and documentary data. Occupy emerged in September 2011. Participants critiqued economic inequality in the wake of global financial crisis. “We are the 99%” became the key slogan of the movement, symbolizing class-based solidarity in opposition to the most wealthy 1%, the government, corporations, and banks. I argue that during the first year of the movement’s emergence and development, gender conflict was central to the movement’s organizational structure, collective identity, tactics, and strategies, and the emergence of feminist spin-off mobilizations (see Images 1 and 2). The organizational structure of Occupy was not inherently “bad,” but like many organizations, even egalitarian ones, attempts to change patterns of gender inequality often failed because gender inequality has been so deeply, and often invisibly, embedded in everyday habits. Even though Occupy sought to be a non-hierarchical, democratic, and egalitarian organization, leaderlessness, structurelessness, and volunteer participation along with the threat of police repression created a male-dominated organization that led to the marginalization of women leaders. While gender conflict was pervasive and weakened Occupy, gender conflict was also productive and contributed to the development of feminist mobilizations and feminist leadership within the movement. In Occupy, gender conflict along with gender egalitarianism and expressions of sexism alongside feminism, point to the successes of, as well as the backlash against feminist movements, and the profound resilience of gender inequality in social movements. How did you use ATLAS.ti in the study? The Primary Documents Manager was indispensable for tracking the different and rich types of qualitative data that I used in my mainly ethnographic and interview-based project (see Image 4). My Hermeneutic Unit was comprised of more than 200 different documents including more than 70 interview transcripts, more than 75 field note documents, and a variety of images, conference call minutes, news articles, and online discussions from Occupy websites. 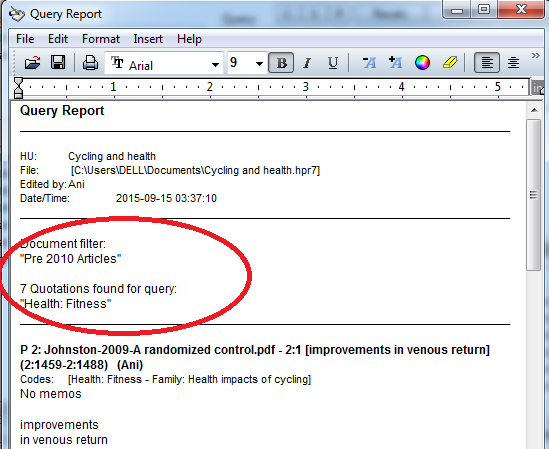 In the Primary Documents Manager, I could easily organize and read through all of my qualitative data in one place. Also, Primary Document Families allowed me to categorize the data (see Image 4 left sidebar). By categorizing my field notes as “field notes” and the locations and organizations that I observed, I could easily analyze Occupy groups. Also, I categorized the interviews as “interviews” and by a variety of demographic characteristics. For example, I labeled the interviews by age category, gender, income, education level, etc. Later, I exported the Primary Documents Families information into Excel to aggregate the demographic information and create tables about the diversity of my interview participants. I approached coding both deductively and inductively. Initially, I transcribed all of the interviews and became deeply familiar with each participant. Then, I immersed myself in the field notes, interviews, paper and electronic archives by reading through the transcripts and documents multiple times. As I read the field notes, interviews, and archives I wrote memos about key themes. Later, I used the memos to develop broad codes. These codes became the basis for analyzing the field notes, interviews, and archive using ATLAS.ti software. First I deductively created broad codes such as feminist_general, sexism_general, femininity_general, tactic_general, and target_general. Then, I inductively created detailed sub-codes and recoded the general coding. For example, feminist_general became feminist_coalition, feminist_infighting, feminist_men, feminist_meeting, and feminist_politics. I wrote the analysis by editing and adding to the memos, summarizing code output reports from the ATLAS.ti coding, and referencing the paper and digital archives. I developed the findings of the study largely using the qualitative analyses because the qualitative data provided rich explanations about gender dynamics and protest (see Image 5). In addition to facilitating my research, I have found ATLAS.ti to be a wonderful tool for teaching qualitative methods. From 2013-2015, I worked as a Lab Manager and Lab Assistant for the Broom Center for Demography at UC Santa Barbara where I taught several mini-courses and dozens of informal trainings in qualitative and quantitative methods on topics such as computer assisted qualitative data analysis using ATLAS.ti, content coding techniques, and Introduction to Stata. 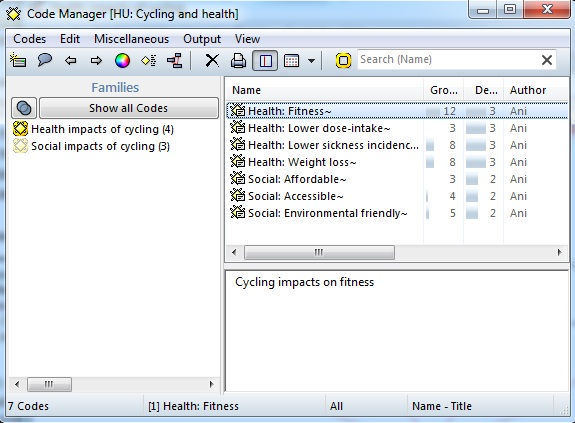 The ATLAS.ti software provides functions that encourage rigorous field methods. Sections in the Code Manager for writing notes about each code provide an opportunity for students to explain coding and develop a codebook as they develop their projects. 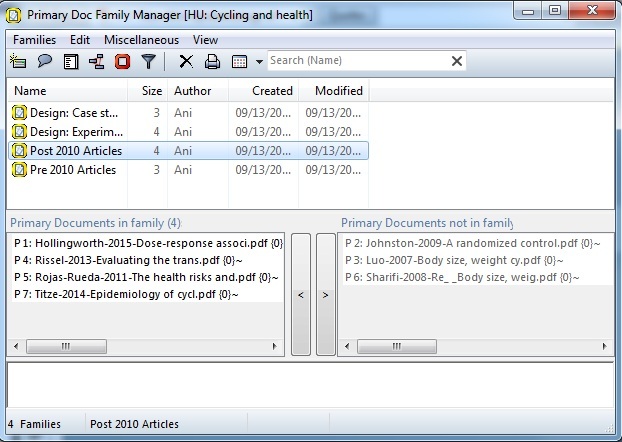 The Memo Manager allows students to be reflective about the research process and document the development of their analyses. The software affords a variety of ways to examine coding from easily flipping through Primary Documents to running code-specific output reports. My students, colleagues, and I have benefited by using ATLAS.ti to organize, immerse within, and make sense of dense interviews and ethnographies. I recommend bringing ATLAS.ti into the field to immediately, consistently, and effectively organize ethnographic field notes, interview data, and emerging analyses. I am in the process of completing certification to be an official ATLAS.ti software trainer because I have seen a range of social science research projects with rich and extensive qualitative data - including my own dissertation research and analysis - transform from unwieldy to enlightened projects by using ATLAS.ti.